We love a good vegetarian twist on barbecue. In fact, we even put together an entire post with tips on "How to Throw an Epic Vegetarian Summer BBQ" last summer. Now the menu is growing! 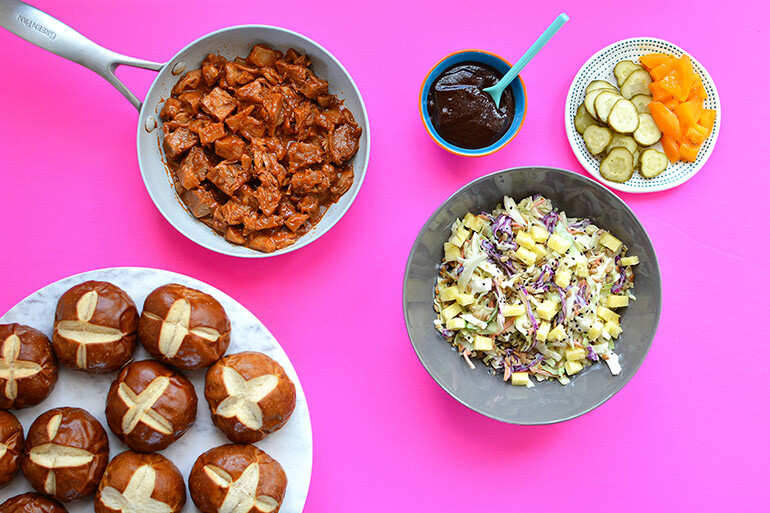 The BBQ Jackfruit is the perfect base, while the pineapple slaw and dill pickle rounds add the perfect crunch to these sliders. And of course, serving with chips and fresh cherries is always a good idea. Doesn't this bright pink background and gorgeous pineapple just scream summer?! 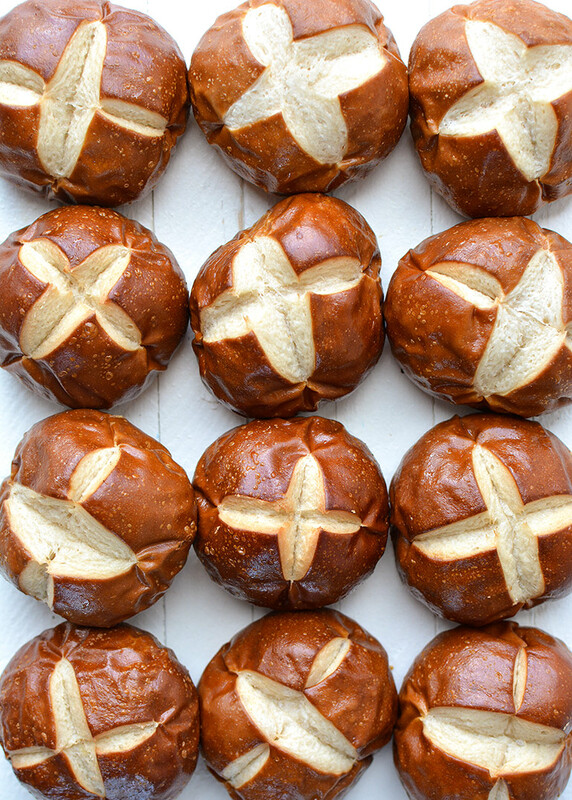 Aren't these pretzel slider buns the CUTEST?!? The BBQ jackfruit really does cook up to a similar consistency / texture as pulled pork, but is 100% vegan / plant-based. I find it all very fascinating! Have you ever seen a jackfruit (like the whole fruit) at the grocery store? They are GIGANTIC and end up costing $30+ because it's just so darn much. Buying this pre-packaged version (see packaging at the bottom of this post) is sooooooo much cheaper and simpler. It tastes great too! So, grab these items at your local Meijer (or closest grocery store) and get cookin' this summer! Plant-based eating never tasted so good! ////////////////////////////////////////////////////////////////////////////////////////////////////////////////////////////////////////////////////////////// Disclaimer: this is a sponsored post written by me on behalf of Silk. The opinions, text, recipe, and beautiful photos are all mine. Thank you for supporting brands that support Nosh and Nourish!! I choose them based on what I already cook/create with and feel 100% confident in recommending to you. 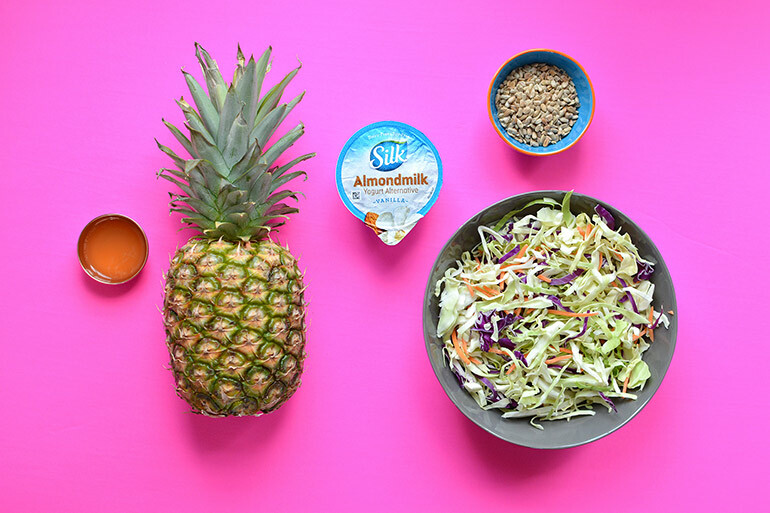 In a large bowl, combine all of your coleslaw ingredients. Stir until thoroughly combined. 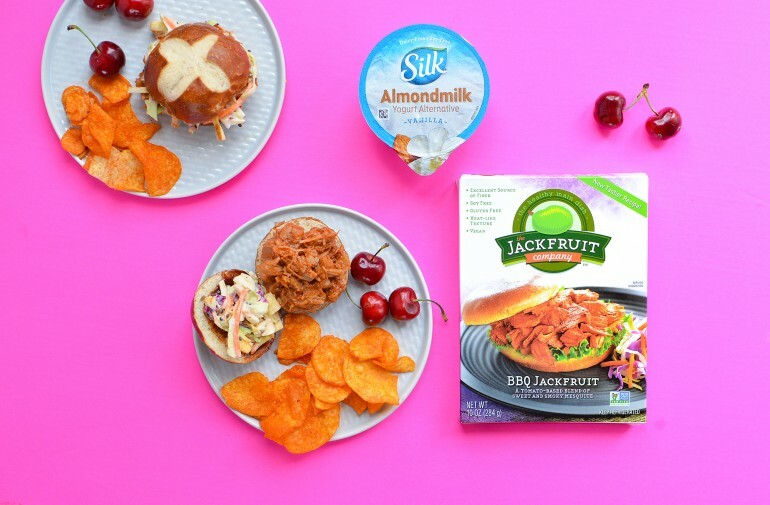 In a large skillet, over medium heat, warm up the bbq jackfruit for 5 minutes, stirring occasionally and breaking up any large pieces with the back of a spoon (directions are also on the box). 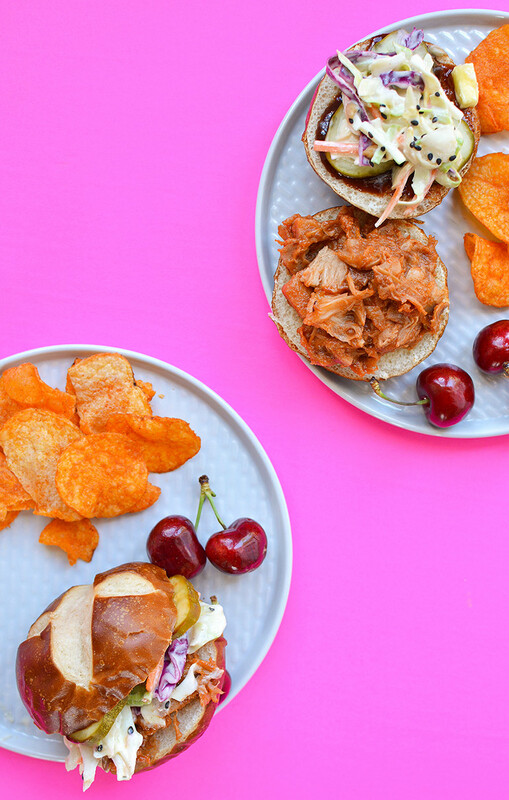 Assemble your sliders: On one half of the bun, put a generous portion of the bbq jackfruit. Then on the other side of the bun, spread on a bit of extra barbeque sauce (optional), lay a few dill pickle slices in a single layer, and then add a dollop of the pineapple slaw. Put the two halves together and enjoy! Serve with chips and fresh cherries (optional, but recommended! ).